Every once in a while, I’ll be heating up something in the microwave and wonder, “how come they haven’t invented the same thing for making stuff cold?” Well it looks like I wasn’t alone in those thoughts, as Korean appliance powerhouse LG is adding a new feature to some of their high-end fridges – the Blast Chiller. 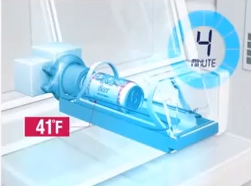 The Blast Chiller compartment can cool a 12 ounce can of beer from room temperature to a delightfully chilly 41 degrees in just four minutes. It can do the same with two cans or a bottle of wine (or a bomber of beer) in eight minutes. The chiller blasts its target with jet-engine-level bursts of freezing air while the can is gently swirled to prevent the formation of ice crystals inside. This is the culmination of knowledge that LG acquired across the wide variety of appliances they manufacture. The chilling power is based on their air conditioner technology, and the swirling mechanic is from their experience building washing machines. All in all, it’s a neat idea, but it this a silly gadget or a godsend? At first blush I’d say it’s a godsend, but then I remembered I’m an adult who can manage my own beverages and who mostly prefers dark beers served at or near room temperature, so this is a feature I probably wouldn’t use much. That puts it in “gadget” territory for me. I’m also a little nutso about fridge real estate, and this little gizmo takes up enough space for 8 to 10 cans of Dale’s Pale Ale, which I’d rather have waiting for me in that spot, rather than waiting four minutes to chill just one. 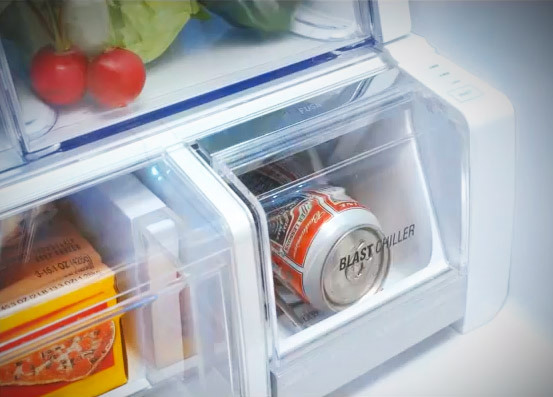 All told, it’s been awhile since I’ve said, “I wish I had a microwave that can chill this beer,” so I’m gonna have to say the Blast Chiller is more novelty than must-have. But then again, I’ll be shopping for a fridge in the next few months, and knowing my nerdy self as I do, you can bet I’ll probably try to steer my wife to the LG’s. Meh. I just toss a bottle in the freezer for a few minutes and let it warm to the temperature I actually like. Honestly, in the winter, my cellar keeps beer cold enough for my taste, especially imperial stouts and barley wines. I’m right there with you, Zac. “Garage” temperature usually does the trick for me. My kids would love it for the novelty, but then it’d just sit unused. 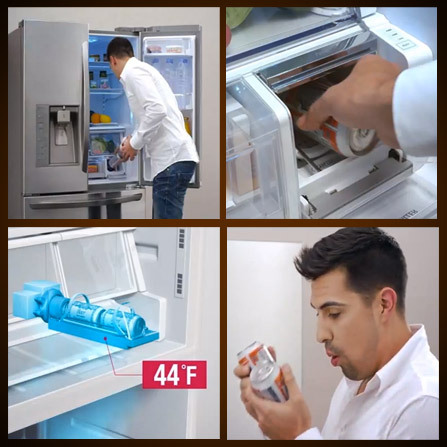 So basically, it’s the Wii of refrigerator technology. The dude in the pictures seems unreasonably excited to be holding two cold Budweisers in his hot little hands. I find that for “emergencies” the freezer works just fine. This seems like one more thing that will break and cost a fortune to replace. You should watch the video – HE’S AMAZED!!!! I set a timer on my phone to prevent that, otherwise I’d be cleaning up frozen beersplosions at least a couple times a year. I think we wrote about it but can’t find the piece. Anyway, good and geeky, but mostly silly. Wait a minute….. Doesn’t Coors already have a train that does that? I think this is a really cool feature, mainly for wine. I don’t have a cellar or wine fridge so we often keep our wine stored at room temp. There have been many times when we didn’t have a white chilled when we wanted it. I think I could work around the real estate it takes up. It may free up space because now I don’t need to keep 6+ cans of beer in the fridge (when Sierra Nevada releases their cans any day now) and can chill on demand. 22oz bombers are even more of a pain to find space for because they fit on most fridge shelves. On the flipside it’s not ideal to keep wine or beer at room temp for long periods of time and this would only encourage this bad practice. I could see where the white wine set would like this feature, as the bottles take up a lot of space to keep chilly. But they aren’t playing each other (yet), Don. Why so harsh?! Because I HATE the Niners! I actually have a cheesehead that I wrote on many years ago that says Packers Rule Niners Drool! I agree that the Packers could probably handle this guy, but probably not the mind-blowingly awesome deal he’ll get you on a new Malibu! I meant Alex Smith. I’m just so flustered that someone mentioned the Niners on this obviously Packers site! Our folks are from Milwaukee and our dad was a Packers fan. Our other family team in Da’ Bears! And hockey doesn’t count. Ever. Bite your tongue Jim. I’m not a Bears fan…ever. Plus I’m Milwaukee Born. Your defense is suspect. You had better hope if the Niners beat the Saints they lose a few DB’s or we’re going to be in Rodgers face all…day…. long! It will be the battle of the draft picks. Your precious Rodgers grew up in Chico, CA, clearly Niner territory. What about that Garcia kid you hate? Spoken like a true NY Homer. Giants are good, but not good enough. The weather won’t favor a passing game…tbis will be won on defense and ground game…I see the Giants with the advantage…should be a good game in any case…GO PATS!!! Pats will get Tebowized this weekend! That’s crazy talk, Don. Put the Kool-Aid down. Crazy like a Tee-Bow…OK that made no sense, but you gotta give the kid props, he does win games. I’m actually rooting for Tebow, but then again I’m a Jets fan, so the Patriots are my natural enemy and I obviously have a predilection for underdogs. Goddammit Jim…just when I was starting to like you. …and that centaur stuff is incredibly creepy. Apparently one of the beards from Color Me Badd found work in the beer industry. I’ve yet to show this to my wife who works in the same industry but for GE, not LG. Her immediate reaction will be, “that’s dumb”. Why is this needed, most guys have a beer fridge anyways or use their cellars to keep the beer cold. Agreed – it’s dumb, but cool if they ever figure out an application for it that’s more useful. What man cave has fresh radishes but no beer? Why do I have a feeling those guys were probably watching Project Runway and not the NFC title game? And what moron goes to the store for beer in the FINAL SECONDS OF A PLAYOFF GAME?! Plus, the fancy fridge wouldn’t help him – he apparently didn’t have any beer to chill in the first place. A deeply annoying video, but one I love for it’s awfulness. I despise all beer that would be served at such a temperature, and I find white wines unappealing. Maybe a quick chill on a bottle of champagne? I could see a use there I suppose, but I so seldom even bother with champagne, mostly just around the holidays. All in all, I’d prefer to retain usable shelf space. Me too – we’re always fighting for fridge space. I could see this as the perfect compromise for the hen pecked husband who’s wife won’t let him have a beer fridge. I’m pretty sure that’s a reality somewhere. Sure, but that nasty hen would probably break the Blast Chiller with her Oprah wine-of-the-month club selection or something! I love me my beer fridge. Its set at about 50F, the same temp. you’d find in say, the basement of an English pub, a wine cellar, or the nether regions of a Belgian Monastery? And it holds a lot more than 2 beers at a time too! That’s a stitch, but so damn typical of the mind-set of many senior NCOs, who, contrary to some opinions tend to be innovative, impious (in the sense that they view officers w/ a great deal of sceptiscism), and to think outside the box. Wow did this get threadjacked. Anyway, I think that MythBusters showed that you could cool beer rapidly with a mix of salt, ice, and water – the salt allows the water to remain liquid colder than 32 degrees. As long as it doesn’t add $1000 to the fridge I would certainly be interested! this sounds like something I’d find at Brookestone, the store for all things unnecessary for practical use (unless you like wasting money on something fancy).